Happy Friday Eve! Gosh this week has gone by fast! Today I thought I would share three things about my crew right now. A little peek at what everyone is into right now. Ella is currently one month out from her school play. She is a pirate dancer in the fifth grade production of The Magic Tree House, Pirates Past Noon. She has been loving learning her lines, songs and sharing all fun she has at rehearsals. We can't wait to see her perform! She is still the most organized in the house. She loves her new Happy Planner and wrote a little blog post about it last week. Ella loves making slime (insert an "ugh" here from me...I am not a fan of slime). She loves it and has made a "business", EGP Deluxe Slime. She has a "Slimeatory" set up in our basement....has a google doc with all the varieties she offers... and gets orders from her friends for slime. She is one happy slime-maker! Before I start on Luke, I have to say he is tougher with three things. Luke gets really into one thing and is borderline obesessive with it. Then overnight it can change to something new and he wants nothing to do with his previous obsession! So as of this week, here are his three things. Luke started playing basketball this Winter season and has really gotten into the game. He loves playing at practice and playing with our hoop in the basement too. He has also really taking a liking to watching games on TV too. Both college and NBA. While he loves basketball, he still is pretty into football. He can name so many football stats, players, numbers, records... it's crazy. I don't feel like he watches an inordinate amount of football, but he soaks up the stats like a sponge. And he rotates his football jerseys.......I think he wears one to school every day! Luke is not a fan of wearing bulky winter things. He asks daily if he can wear shorts and would be happy to go to school in a hoodie (keep in mind our temps have hovered near zero lately). Last week he went to school in shorts and snow boots. I have been trying lots of new plant-based meals and been loving it! I am sharing one every Monday here on the blog. 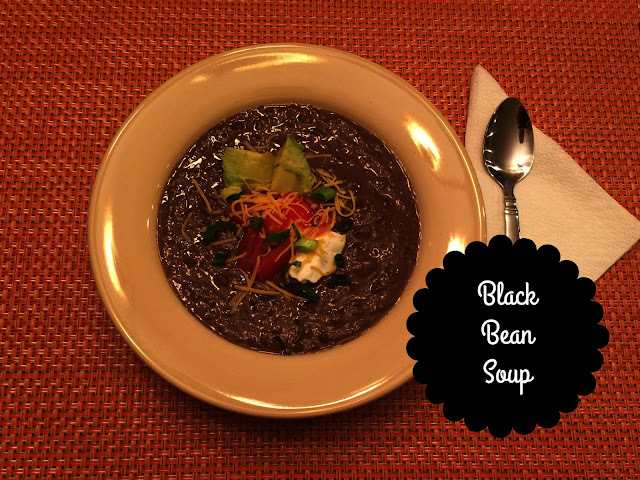 This week I shared a favorite soup. We are both looking forward to a little warmth and sunshine, as we head down to visit Paul's parents next month. I don't mind the Winter, but am definitely ready for a break soon. Lots of sun, seafood and relaxing on our agenda! Have a great Thursday. See you tomorrow for Friday Favorites...there's always room for one more at our family table. I made the soup yesterday. I only had one can of black beans, so I more or less cut the recipe in half, and made it for lunch. Loved it. Fast and delicious. I think it is a boy thing where they don't like to dress warmly. It isn't a phase either. My son is walking around the University of Illinois in shorts and a sweatshirt. Hi Kathy...glad to hear you liked the soup! It is a perfect lunch. I think you are right with the boy thing and loving shorts! Thanks for stopping by!